This list could be quite long but for now, here are a few things that have become my favourites in Hong Kong. Flagging down your waiter: In HK, when you want to get the attention of a waiter, you put your hand up in the air like an eager student and wave. Sometimes you might even wave your hand with the menu in it. Instantly, a server will come to your table. You rarely have the same server throughout a meal, which is perfect because then it doesn’t matter who you wave over. It’s whoever is in the vicinity and sees you wave. I love this. It saves so much time. Fast food: In HK, there are a million places to eat that serve freshly prepared, healthy food really quickly. These places aren’t fancy and you don’t linger over the menu or conversation afterwards. Often, you start by queuing – and restaurant queues move impressively fast here – sit down, decide quickly, wave your arm around, and presto! Stir-fried vegetables, noodles, soups, dim sum, meats, fish – prepared fresh and delivered quickly. I will add that people seem to eat ALL the time here and order vast amounts of food. This in-and-out system caters well to that. Awesome public transportation: The MTR, as the subway system is called, is clean, bright, quiet, cheap and super efficient. Any combination of public transit here – which includes MTR, buses, mini-buses, trams, ferries and taxis – will get you anywhere efficiently and cheaply. Particularly astonishing is that you can get from the most densely populated part of the planet (Mong Kok) to virtually any country park in 20 minutes entirely by public transit. Compare this to Canadians who have to load up a vehicle and drive for hours to hike, climb, paddle, etc., and where many cities’ public transit leaves the public … well, without transit. Orderly and quiet movement of so many people: You would think that with 8 million people crammed into such a small area, it would be chaotic and noisy. It isn’t. People walk slowly – not what you would expect, but I find people really amble here. I’m in the “passing lane” all the time. Hong Kongers even observe staircase indicators showing on which side to walk up or down, and they are pretty religious about standing on the right on escalators so people can walk on the left. You aren’t jostled by people running or pushing. MTR cars are surprisingly quiet, but I’m sure that’s because everyone is on their cell phone all the time. Green space: I’ve written before about the amazing country parks that are everywhere in Hong Kong and Kowloon. All of the country parks have well marked, paved trails – with WAY too much concrete, but oh well – that provide scenic and welcome escapes from the density of the city. The hikes tend to be uphill all the time and never down, so you need to be prepared for quite a workout. 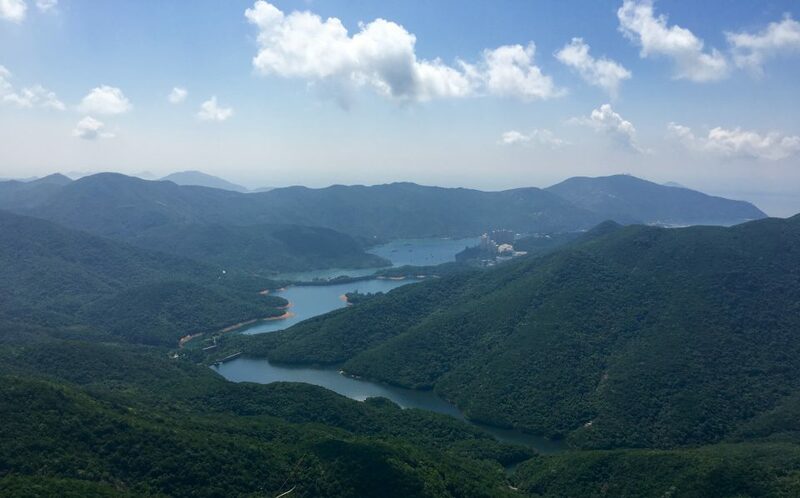 Many Hong Kongers are more than avid about hiking: they are addicted to it. Rain or shine, they must walk, minimally on the weekends and often daily. It’s a way of life for some. This gives you an idea of the “up” part of the hiking here. Ainsleigh took this on Friday; sadly I was not with her because I had to work. I look forward to tackling this walk another time. Sales at medical clinics: HK has a mix of public and private health care. Being a newbie to the private system, I still get a jolt of surprise when I have to hand over my credit card as I leave the doctor’s office. But the real surprise is when I see signs in clinics advertising things like: ”Amex cardholders are eligible for a 12% discount on the ‘Elite Physical Examination’” or “Mother’s Day Special: 50% off flu vaccines! !” I realise this is normal to people from other countries, but as a Canadian accustomed to public health care, it still makes me do a double-take. This is also from Lion Rock. This is considered a medium- to medium-high level hike.